After a back-and-forth game, the Ohio State softball team picked up its first win of the Big Ten season in its home opener. The Buckeyes (16-9, 1-0 Big Ten) defeated Indiana (25-7, 0-1 Big Ten) 7-6 in the first game of the three-game series Friday afternoon. After facing a 6-4 deficit heading into the bottom of the sixth inning, sophomore designated player Kallie Boren hit a two-run home run, her second of the season, to give the Buckeyes the eventual 7-6 win. Ohio State head coach Kelly Kovach Schoenly said she’s really proud of players for being able to push them across the end. 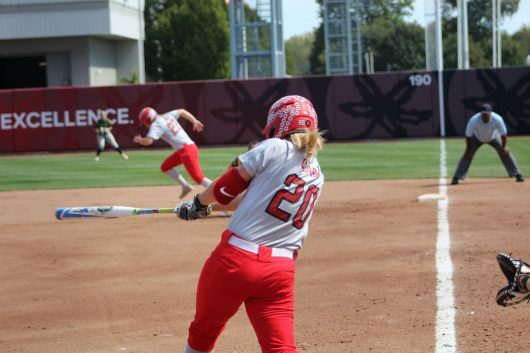 With an early start due to weather, Ohio State saw an early deficit as senior pitcher Morgan Ray allowed three runs in the second inning with a solo home run by Indiana sophomore first baseman Annika Baez and a two-RBI double. The Buckeyes soon turned the tables in the bottom of the second inning. Freshman third baseman Ashley Prange put the Buckeyes on board with a two-RBI double to left field. Senior shortstop Lilli Piper hit a two-RBI single, giving Ohio State the 4-3 lead. But Indiana came back, as Baez added her second RBI of the day on a double in the third inning. In the fifth, the Hoosiers added an RBI single and a run, took a 6-4 lead. In the bottom of the sixth inning, Ohio State senior second baseman Emily Clark cut the deficit to one run, leading to Clark’s home run. “It was big to go ahead,” Schoenly said. Sophomore pitcher Lauren Rice earned her eighth win of the season, recording 2.2 innings of scoreless relief, allowing two hits. Schoenly was impressed with how the team continued to stay in the game despite the late-game deficit. “In general, being a resilient team is something I am most proud of,” Schoenly said. Ohio State will take on Indiana in the second game of the three-game set Saturday at 2 p.m.